Africa.TradeHolding.com - Battery Balancer 48V, Product by Zhcsolar Solution Inc. The 48V Battery Equalizer can connect Four 12V Batteries by default, no matter in series or in parallel. the maximum compensation current is 10A. For 96V or higher voltages Battery group, multiple 48V equalizers can be connected in parallel. Battery Equalizer is recommended for use in autos, boats, golf carts, motorcycles, solar, trucks, RV's, electric forklift batteries, and any other battery groups Configuration. Specialized for keep up the voltage balance of batteries connected in series during the Charging and Discharging process, due to differences in the chemical composition and temperature of the battery cell that connected in series, It causes two battery charge and discharge differences even the battery is idle, also due to the different levels of self-discharge could lead to an imbalance between serially connected battery at a charging process, because there are differences, it could make a battery excessive charge or discharge, and the other one insufficient charging or discharging. BE battery equalizer can compensate both parties when the battery is connected in series as voltage difference exceeds 10 mV, then the battery equalization starts to work, Final achieved the balance of the batteries set. It can be connected for long periods for automatically battery state of equilibrium. 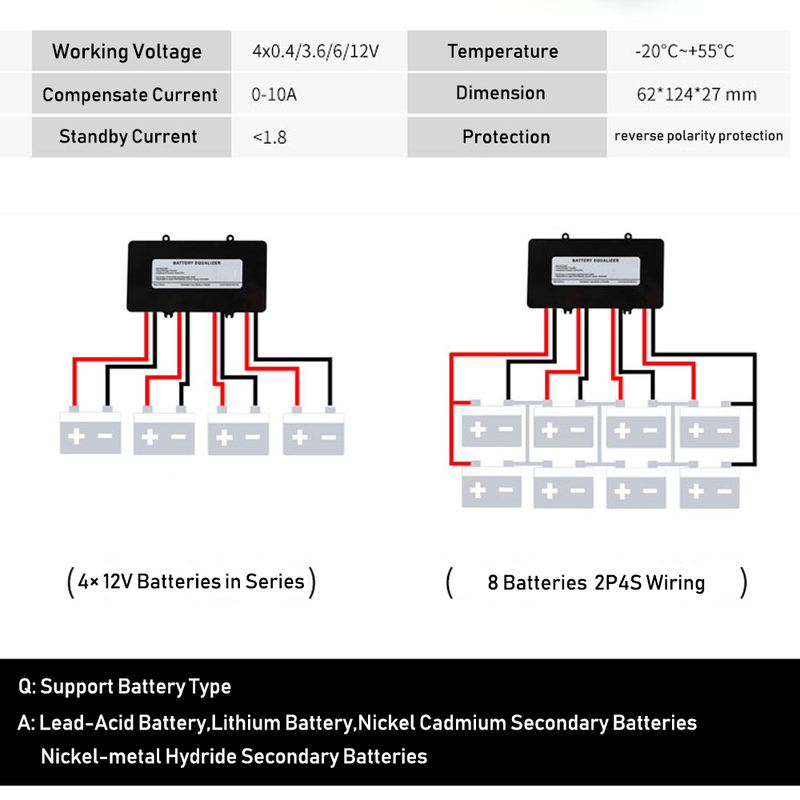 48V battery equalizer is suitable for Lead-acid Batteries (VRLA), Lithium Iron Phosphate Batteries (LFP), Nickel Cadmium Secondary Batteries (Ni/CD), and Nickelmetal Hydride Secondary Batteries (Ni/MH). It starts work when the voltage higher than 2.4V, it means that this equalizer can be used in a single cell battery range from 2.4V to 12V.